Harold’s Corral is One of Arizona’s 17 Most Iconic Bars! This barn-like hall was originally built in the name of an old Arizona tradition: getting a piece of the massive federal largess that’s flowed in here through the years. The workers who built the Bartlett Dam in the late 1930s needed a nearby place to spend their paychecks and forget their cares. An entrepreneur named Johnny Walker was there to help them with a place he called the Corral Bar. A promoter named Harold Gavagan bought it a few years later, filled it with honky-tonk gimcracks, brought in some country-and-western bands and called it a “wild west” bar, even though very few actual ranchers were among the customers. Sports plays on the TVs and there’s off-track betting. 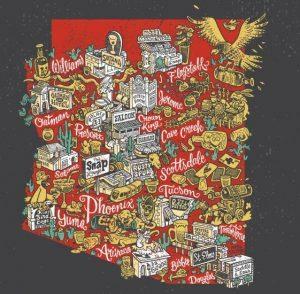 It’s worth seeing how Arizona looks at itself in a mirror and reflects itself back to the rest of the world.